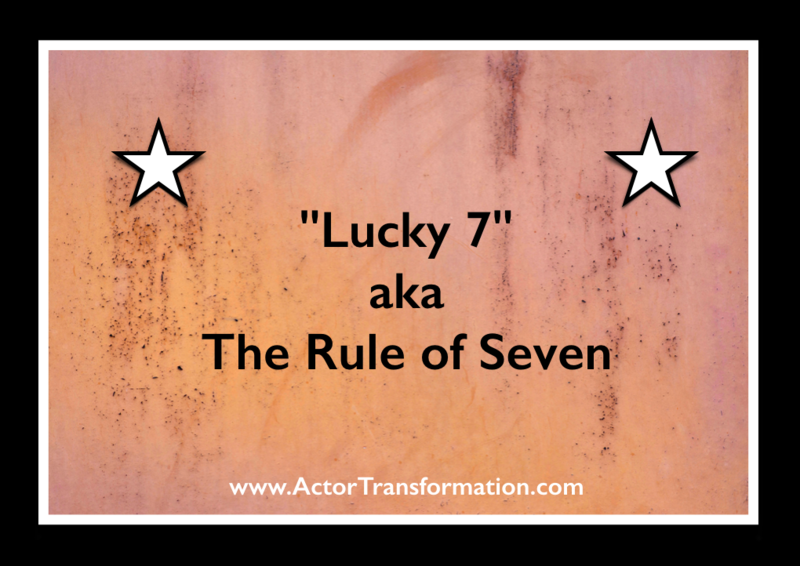 There is a well know theory in advertising widely known as “The Rule of Seven”. This commonly refers to how many times it takes for a consumer to see an advertisement before actually recognizing, remembering and/or buying the product. As actors we must know what we are as a product and how to sell ourselves to the industry. As in all advertising, (and with actors) there are some “products” that have more appealing packaging, some products work much better than others, and products vary in cost from everything from free samples to high-end products that cost millions of dollars to “purchase”. We are no different. It is said that when learning something for the first time, many people only retain around 15% of the information. Therefore repetition in marketing is key. Actors sometimes feel like if they met a producer or casting director once or twice and have not been called in to audition, then the meetings were failures, or the casting director does not like them, etc… But there can be countless reasons why they have not called in a particular actor that has nothing to do with the actor at all. ~ You look like their Ex… And they no longer like their Ex. ~ You only put your agent’s info on your resume and you have had 2 agents since then but they still have your old resume. ~ You don’t look like your headshot so they cannot match up your headshot with the memory they have of you. ~ They simply do not remember who you are! Some of these we can remedy and some are beyond our control. To remain sane in a nutty industry, I recommend that you do not waste another moment on the things you have no control over and apply all that time, thought, and energy towards the things that you DO have control over… like getting in front of your target people multiple times. Here is a SAMPLE of how you might contact one industry person multiple times while still staying positive and professional. 2nd Contact = Mail out a thank you card for their great advice they provided. (Even if a director, producer, or casting director does not accept you as a friend on their personal facebook, many of them are now wanting more followers on their fan pages, twitter, blogs, etc…) Don’t forget that they are looking for their next jobs just like actors are. 5th Contact = Your own Email Newsletter. This is one of my favorite promotional tools as it is just a tiny bit of data entry and your database gets larger and larger the longer you are in the biz. So once you have built up your database, you can design a lovely email campaign and send it out to thousands of industry with a click of the mouse. This invaluable tool was referred to me by a casting director friend a couple years ago and has changed how my career is marketed. Click here. THIS IS A VERY good use of your time, money and energy. 7th Contact = Could be anything. A class, an audition, a call, email, invite, twitter, workshop, mailer, newsletter, seminar, blog, party, post, etc… whatever makes sense for that particular person and in each specific situation. And make sure that you do not give up after only one or two points of contact with an agent you want to sign with or Casting Director you want to audition for or Director you want to work with. WE MAKE OUR OWN LUCK!